Aboard the Race Committee Boat INDIAN, AYC RC member Ed Richards fires the start cannon while the red-over-white cylinders of the Special Cruising Class signal are hoisted during the AYC Annual Cruise Squadron Run of August 1938. The white ball Recall Signal is at the ready, tended by Don Worth, in case one or more of the yachts passes the starting line before the gun. “Calling the Line” is Roger Sherman at the white start flag on INDIAN’s bow, while Sam Mays, shown just forward of the ventilation funnel, serves as Timer. The signals “E S K Y” fly from the fourth hoist, signaling “Squadron Get Underway for Port Jefferson” and “A L” from the fifth, notifying yachts in the fleet they may pass government marks on either hand. Race Committee Chairman Fred Hibberd, shown at far left, oversees the action from the signal deck. The brand new S&S yawl EDLU II, owned by Rudolph Schaefer is, as usual, quick off the line. 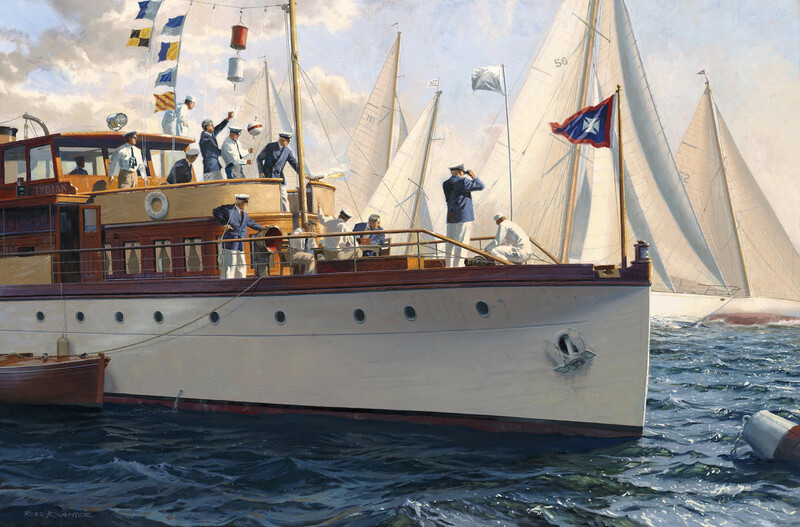 This original painting is in the collection of the American Yacht Club in Rye, NY.